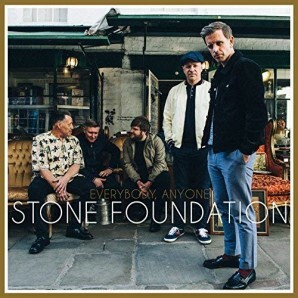 Stone Foundation have raised the bar higher once again with their stunning new studio album ‚Everybody, Anyone‘: The Midlands based band’s 5th studio album was recorded at Paul Weller’s Black Barn Studios in Surrey and produced by Stone Foundation founding members Neil Jones and Neil Sheasby and engineered by Charles Rees. Everybody, Anyone features 11 new songs and as before, there’s a sprinkling of guest musicians who feature on the album including Kathryn Williams, Dr Robert, Mick Talbot, Steve White, & The Average White Band’s Hamish Stuart. And unable to stay away, Paul Weller (who produced and featured on the last album) sneaks back in with a bit of piano, guitar and Backing Vocals on a couple of tracks!